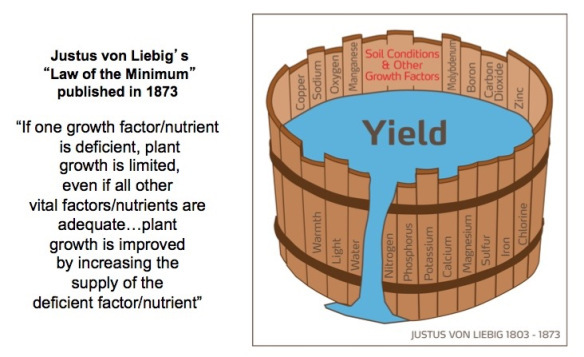 Justus von Liebig’s famous “Law of the Minimum” principle implies that crop yield is proportional to the amount of the most limiting essential nutrient, whichever nutrient that may be. And although each nutrient is needed by the plant in different amounts, it is the relative amount of each nutrient available (usually expressed as a percentage of ideal) that may be limiting. This “law” or “principle” of the minimum was formulated by Carl Sprengel, a German botanist, as early as 1828. It became more well known when German biochemist and professor Justus von Liebig publicized and studied it more widely starting around 1840. Liebig’s work became the foundation for laboratory oriented teaching as its known today and earned him consideration as the “Father of the fertilizer industry”. Simply put, Liebig’s Law of The Minimum summarizes that plant growth and health is not controlled by the total amount of nutrients available in the soil… But instead plant growth and health is controlled by the scarcest of the nutrients available in the soil. Liebig’s Law many times is summarized with the icon of a leaking bucket. The factor of which is the weakest or slowest on the bucket is where the bucket leaks. It is also described using a chain example – the weakest link in the chain is where the chain will break. The concept first stated by J. vonLiebig in 1840, that the rate of growth of a plant, the size to which it grows, and its overall health depend on the amount of the scarcest of its essential nutrients that is available to it. The supply of mineral nutrition to plants depends on the soil, the plant, and the microbes of the soil foodweb. The way these systems interact is a crucial and highly dynamic process – nutrient shortages (relative and absolute!) can and do impact plant growth, health, and fruiting at critical times in the growing season. Critical shortages of any particular element may stunt or even stop the growth of a plant even though other nutrients might be in plentiful supply. A typical example of an information feedback loop between these systems causing a problem would be the “stunting” of a young plant. By 2016, Cobalt, Sodium, Vanadium, and Silicon have been added to the list, although all authorities do not agree on some of the recent additions. As better and more precise measuring tools become available additional elements may be defined as essential, adding to the list of potentially limiting elements for crop production. As an interesting example, Cobalt has been lately shown to be highly important in the production of Nitrogen in legumes. The availability of plant essential nutrients affects the growth, quality, reproduction, and immune systems of plants. Though they are needed by plants in differing quantities, all must be present for a plant to live, and they must be present in the needed amounts for a plant to thrive. There are many challenges to plant growth throughout its life cycle, and it is not always easy to determine the cause of any particular problem – proper mineral nutrition is important, but only one part of the plant’s growing environment. Liebig’s Law is a very useful concept for agriculture as it simply conceptualizes a concept that is not necessarily obvious to the practical grower juggling many responsibilities. So, “Liebig’s Law” is useful and practical; its implications being important to our understanding of how to most efficiently achieve profitable yields and quality in commercial crops. Soil and plant testing for nutrient content is considered to be the best way to determine shortages and imbalances. But even the best and most expensive testing programs can only provide a snapshot of a “moment in time” in the life of a plant. Keeping in mind the basic relationship of essential mineral nutrients and their relative amounts needed by the plant can help the grower stay ahead of the “fertility curve”. In the next section on Liebig’s Law we will discuss how it applies throughout the life of the crop and how that knowledge can be used to more efficiently grow commercial crops. 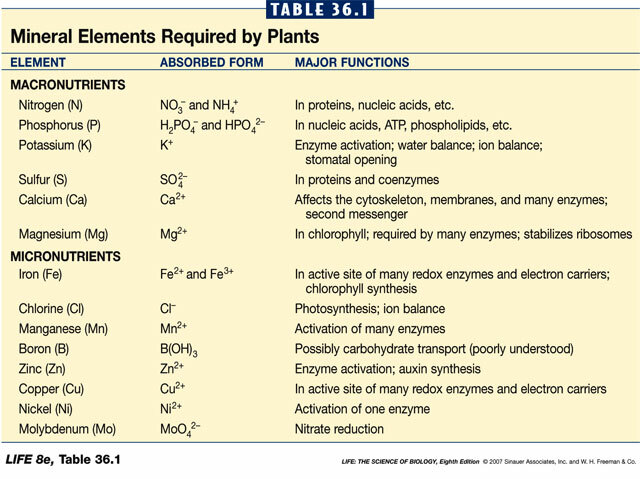 Note that in above hydroponic nutrient chart several “essential elements” are not supplied. Below is a list of essential nutrients from another hydroponic supply company.